يشكل فندق فندق كولينز بموقعه الممتاز في منطقة تسوق, سياحة, الحياة الليلية ضمن المدينة، مكاناً ملائماً لقضاء العطلة بعيداً عن عجقة أيام العمل. يمكن من هنا للضيوف الاستمتاع بسهولة الوصول إلى كل ما تقدمه هذه المدينة النابضة بالحياة. كما يمكن الوصول بسهولة إلى عدة معالم سياحية قريبة. يعمل فندق كولينز على ضمان إقامة مريحة لضيوفه من خلال خدماته الممتازة وحسن ضيافته. يمكن للنزلاء الاستمتاع بالميزات التالية: واي فاي مجاني في جميع الغرف, خدمات بريدية, مطبخ, تسجيل وصول/مغادرة سريع, تخزين الأمتعة أثناء إقامتهم في هذا المكان الرائع. تنعكس أجواء فندق كولينز في غرف الضيوف.خزانة, مواد تنظيف, مناشف, سجاد, غرفة معيشة منفصلة هي بعض الميزات الموجود في العديد من الغرف. يقدم الفندق مجموعة رائعة من الخدمات كمثل مركز للياقة البدنية، لجعل إقامتك تجربة لا تنسى. استمتع بخدمات لا يعلى عليها وعنوان ذو اعتبار في فندق كولينز . يعمل مكتب الاستقبال من الساعة 7 صباحًا حتى الساعة 11 مساءً من الاثنين إلى السبت، من الساعة 8 صباحًا حتى الساعة 10 مساءً في أيام الأحد والأعياد الوطنية. The location is great. However, cleanness matters especially when you traveling with kids. This place clean work has done terriblely and the room was so dusty. Even the daily cleanness surprised us, by just collecting trash and fold the bed sheet. The cookie piece stayed on the floor when we returned, wow us. Age is not a problem, but cleanness does matters! 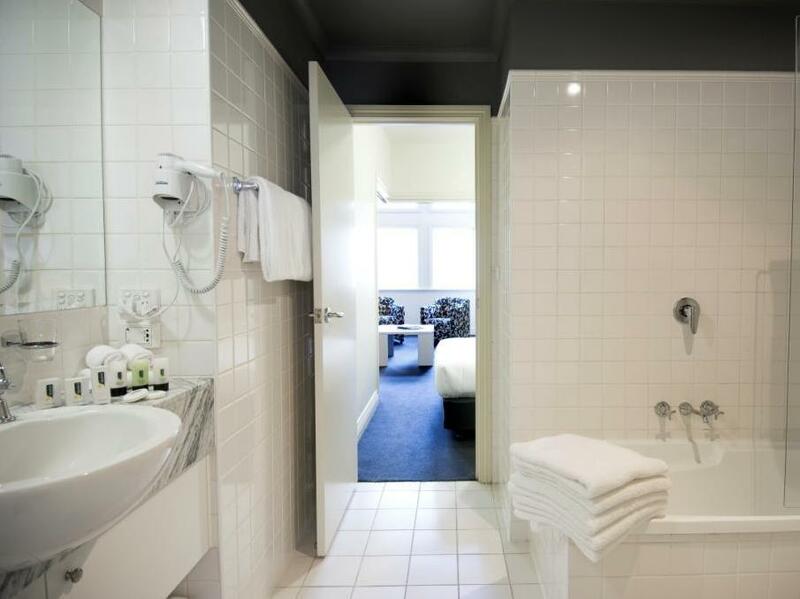 Exceptional apartment, fully equipped, crisp white sheets and fluffy white towels located right in the heart of Melbourne! Friendly staff, excellent wifi, and easy to find. I will certainly return to this convenient discovery! Spacious studio with the necessary modcons. Exceptional service from all staff - especially Momo and KaiDe. - very obliging and helpful. Close to art museums, Queen Victoria market; easy tram connections to lovely suburbs Prahran, Fitzroy, St Kilda, etc. Food outlets everywhere. Great location, and you will be amazed by the room because it is so tidy, spacious, quiet, and cozy. I can stay in the room all day and enjoy the meal we cook in the kitchen. The staff are also helpful and polite. There is only one thing might need to be improved, the range hood works not well, after cooking, all room will be full of smoke. However, it's still a really great place to stay!! The photos don't do the room justice. Ours was very clean with view and spacious. Reception let us check in early, which was very convenient. 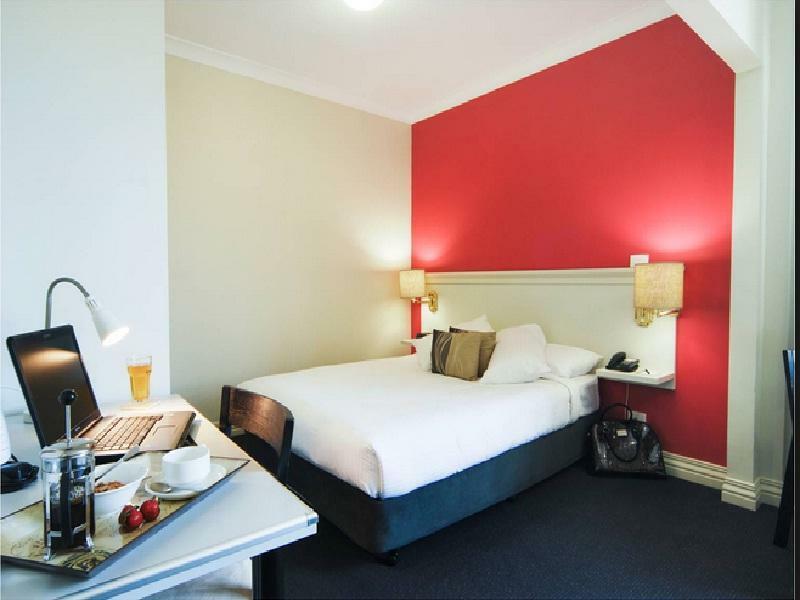 Location also very convenient - right near Swanston st on Collins, with direct tram to ferry terminal. My wife and I stayed overnight in a studio apartment on a 38c day. We opened the door and it felt like we had waked into an oven. The very unsuitable air conditioner could not cool the lounge/kitchen area yet alone the separate bedroom. We had a very uncomfortable night. The bathroom had mouldy tiles throughout the shower area. The Hotel is an excellent position in the CBD but badly needs an upgrade. Clean and big room, but not easy to find. There's no parking space (public car park located 2 streets away, hence challenging to load/unload luggage). Only consolation hotel has parking discount card that helped to reduce parking cost. Collins Hotel is quite difficult to find as the entrance is a space between two shops. However if you can find thee Regent theatre it is on the opposite side of Collins Street. The receptionist was very welcoming and at the end of the stay she looked after our suitcases on the day of departure for 6 hours which was very convenient. The apartment was very spacious and clean with very good facilities. 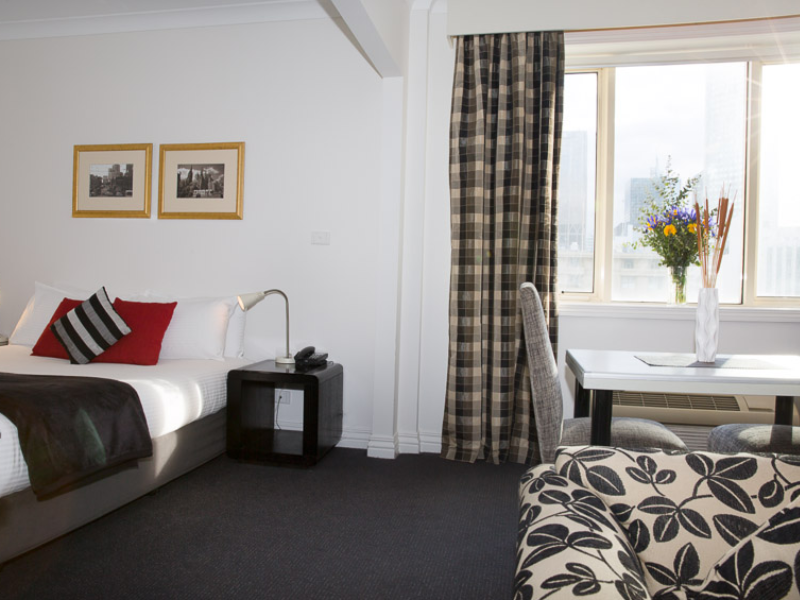 But the great thing about the hotel is the location, just metres up Collins street from the City Hall so finding restaurants and shopping is extremely convenient especially because all tram travel in the CBD is free. I can thoroughly recommend this hotel. 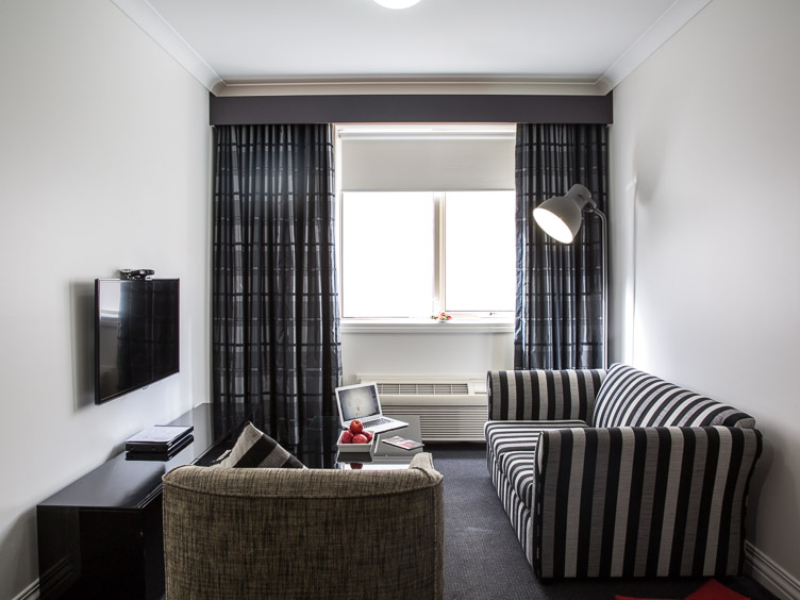 We took our grown up children and we loved the location down the Paris end of town, the rooms were very spacious and clean, not high end Luxe but very comfortable, the two bedroom had fantastic large windows overlooking Collins street. I have to admit I couldn't find the entrance to the Collins Hotel, I walked past it several times. There's no hotel frontage, just a discrete sign above a long corridor that leads to reception. Check in was handled courteously, swiftly and professionally by Jason. My room was on the 2nd floor with a view of the back wall of a theatre building so a little dark. The room was very clean and remarkably spacious given the furniture it had in it. The bathroom was spotless with plenty of hot water and there was great water pressure. Another family member stayed on the 6th floor and her room was better appointed with great views over the city. All said and done this hotel represents exceptional value for money for the budget conscious traveller and I would not hesitate to recommend it. I'd stay here again. Fantastic value for money in a fabulous position. Bed comfy. Bathroom modern and clean. fan in bathroom would be an advantage for steam and light above the mirror wasn't working. TV kept cutting in and out. Staff reception was fabulous and friendly - nothing was a bother to her. Well done! 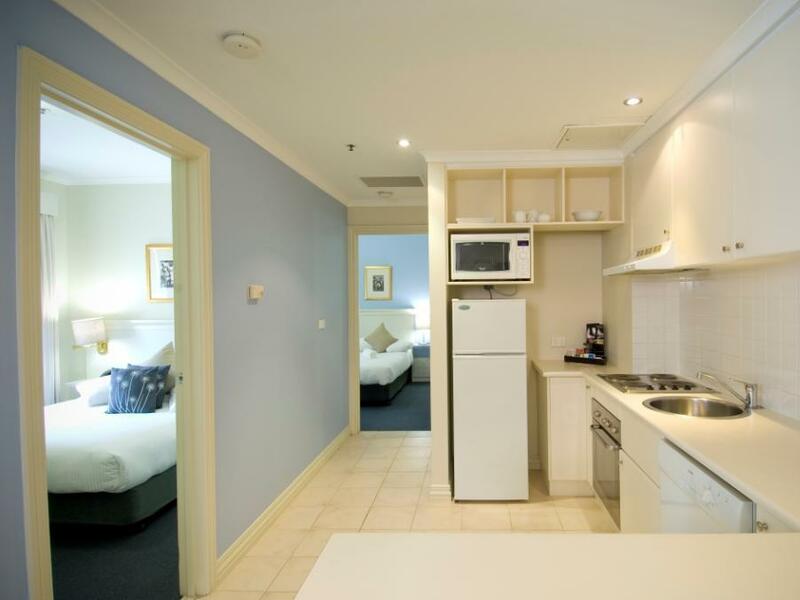 Central location in the CBD and apartment was cleaned daily and basic amenities provided, including complementary laundry facilities. Staff at the Reception was very helpful. Would recommend the apartment for short as well as long-term stay. 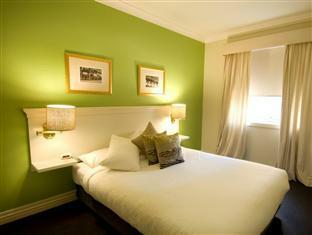 We picked Collins Hotel for the convenience to Rod Laver Arena. The location is great being at the "Paris end of Collins St. The place is quiet and the size of the room and with the facilities provided makes it comfortable enough. However the place has a worn out feel to it particularly the bed. The bed needs updating urgently. It was old and saggy and was not comfortable. As far as cleanliness goes. It appears clean but we were turned off by the poo mark in the toilet bowl in our room (we haven't used it as we just arrived). I have to give credit to the staff who was appalled and extremely apologetic when I brought it to their attention. The front desk staff immediately came to clean and disinfect the toilet and advised that they wold speak to housekeeping as a matter of urgency. This hotel is just behind the Town Hall, and is a great find. We had a 1 bedroom apartment, complete with a microwave and stovetop, and dishwasher. A large screen TV in living room, and a small TV in bedroom. Everything worked, was very clean, and they provide a laundry on Floor 1 with free powder and machines. It was very quiet. Would highly recommend. Located at the heart of Melbourne city. If u are driving u need to park your car at the public carpark which is operated by Wilson Parking. And you need to get the discount ticket from the counter if you are parking whole night at only aud17 dollars. The parking in Melbourne is extremely expensive! Just 5 to 10 mins walk to Railway station and supermarket. Recent metro upgrade and construction causes some inconveniences to the traffic direction if you are driving. Driving in the city is a challenge! Easy access to the airport shuttle bus stop/train station. good size room with sitting are and kitchenette. Bathroom was bordering on unsatisfactory. mould and in need of a facelift. Staff very accomodating and luggage storage was not a hassle.